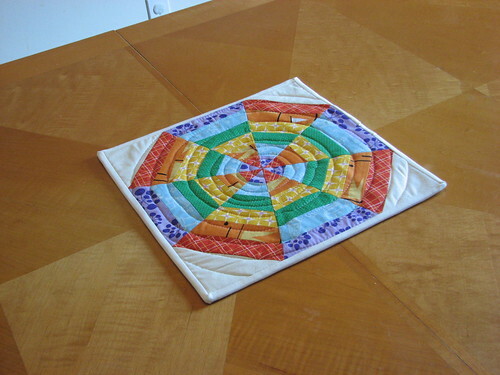 This is my final string-pieced block. I love the look of the spiderweb and was easily able to figure it out. I had a hard time with the color selection. This block was actually my second attempt at the spiderweb. The first was not as bright and cheery – it had a kind of faded rainbow look to it. So, I ended up with a leftover quilt block. 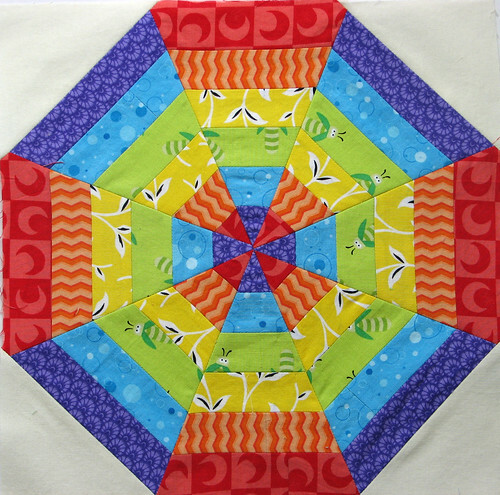 Not knowing what else to do with it, I quilted it up with some Insul-Bright and made it into a hot pad. It looks good on my table, but my husband is afraid to use it. He claims that white was not a good color choice and is afraid it will get stained. Sheesh!